Researcher, organizations aim to reduce exposure by urging vehicles to turn off engines. When children walk into their school building, they may pass through some of the dirtiest air on their travel from home to class. A recently published study by a researcher at Cincinnati Children's Hospital Medical Center and three other community organizations not only proves this is the case, it also points the way to reduce the exposure – simply turn off the engines of idling buses and cars. 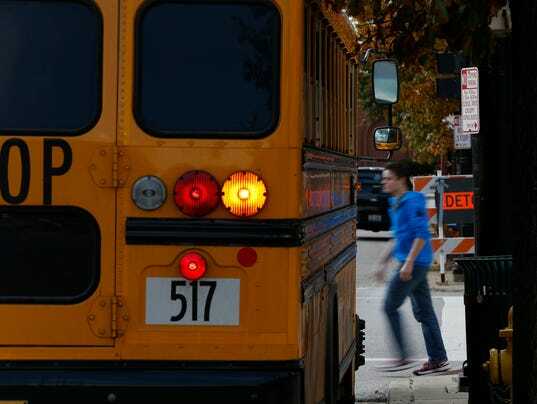 "The concentration of air pollutants near schools often significantly exceeds background levels in the community, particularly when idling school buses are present," said Patrick Ryan, the Children's researcher who was the lead author of the study. "Anti-idling campaigns are frequently attempted to improve air quality, but until now, no one has evaluated how effective they are." Previous studies have shown that children who live near expressways and other sources of travel-related air pollution such as particles and soot are more likely to develop asthma or have the condition aggravated by such pollution. Even short-term exposure to high levels of airborne particles – simply by walking in a street for a few minutes – can seriously diminish lung function in people with asthma, other studies have shown. More than 4,000 CPS students, or about 1 in 8 of the district's pupils, have asthma. The most problematic pollutants – specifically, fine particles 2.5 micrometers in diameter and smaller – can be particularly concentrated when running buses and cars are standing, as they do when loading and unloading passengers. In addition, such particles linger in the air around the schools and their playgrounds for hours after buses leave, said Ryan, who also is an assistant professor of pediatrics and environmental health at the University of Cincinnati. The small particles pose a health risk because they can be inhaled deeply into the lungs and cause serious health problems. Children are particularly susceptible to damage from such pollution for three reasons, experts say. First, they spend more time outside than adults. Next, they take in 50 percent more air per pound of body weight than adults, notes Dr. Marilyn Crumpton, a pediatrician and medical director for the city Health Department's division of school and adolescent health. Finally, children are shorter than adults – nearer to the tailpipes of vehicles and the area where soot is most concentrated, Ryan noted. For the study, Ryan and others studied outdoor air quality at four Cincinnati Public elementary schools in the fall and winter of 2010-2011 before and after introducing an anti-idling campaign. Each of the four grade schools had student populations (as reported by parents) with asthma rates above 10 percent. Following the Cincinnati Anti-Idling Campaign, Ryan and his team resampled the air. Soot levels dropped at two schools, while the concentration of particles dropped at three. The study, paid for by a grant from the National Institute of Environmental Health Sciences, was printed in September in the journal Environmental Science Processes and Impacts, published by the London-based Royal Society of Chemistry. Two years after the first samples were taken, anti-idling signs are still up at the schools. Teachers and administrators continue to ask parents to turn off their cars when dropping off or picking up students. CPS continues to work with First Student, which provides bus service to the district, to have drivers turn off engines after three minutes of idling, said district spokeswoman Janet Walsh. "We have to keep reinforcing the habits," Ryan said. Going forward, Ryan and others will look in depth at health data on students at the four schools. "We expect the asthma symptoms" will be improved, he said. Ryan has another study under review that looks at indoor air quality at the four schools. Generally, that air quality is good but he said the study shows that a reduction in outdoor air pollution "also made a difference inside." Finally, the Children's researcher hopes the anti-idling message doesn't stop at the four schools or the Cincinnati border. "Where (anti-idling) could really make an impact is at suburban schools with campuses" that draw in dozens of buses and have few students who walk, Ryan said. "Most districts are aware (of this research) and are trying to do something."